The cherries are washed, pitted and individually quick frozen and can be used for cooking or just eating as a sweet little snack. TOTAL TIME: Prep: 30 min. Bake: 40 min. In a bowl, combine flour and salt; cut in shortening until crumbly. Gradually add water, tossing with a fork until a ball forms. Divide dough in half so that one ball is slightly larger than the other. Roll out larger ball to fit a 7-in. pie plate. Transfer pastry to pie plate. Trim pastry even with edge. For filling, combine sugar with cornstarch in a microwave-safe bowl. Drain cherries and reserve 2 tablespoons juice. Stir in cherries; reserved juice, lemon juice and almond extract. Microwave on high for 2-3 minutes until mixture comes to a boil and is thickened, stirring occasionally. Pour into crust. Dot with butter. Roll out remaining pastry to fit top of pie. Place over filling. Flute edges. Cut slits in pastry. Bake at 400° for 15 minutes. Reduce heat to 350° and bake 25-30 minutes longer or until golden brown. Cool on a wire rack. Sweet cherries have several cancer-preventive components including fiber, vitamin C, carotenoids and significant levels of anthocyanins as well as other pigments in perhaps smaller concentrations that together provide synergistic effects thought to be protective to heart and related vascular tissue. Sweet cherries are a good source of cyanidins, which appear to act as an antioxidant and in this role may reduce cancer risk. 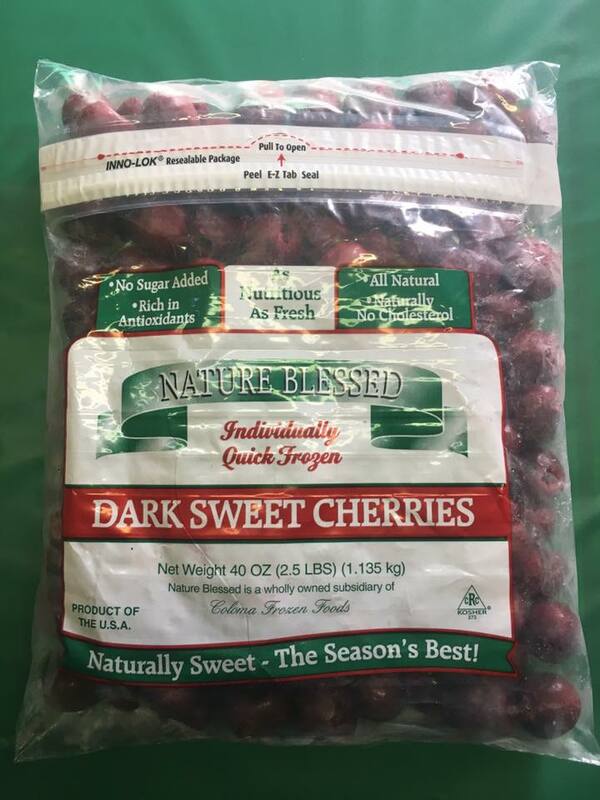 When ordering keep in mind that if you want the sweet cherries to arrive frozen you need to choose an overnight or 1 day shipping option. If you choose another shipping option the sweet cherries will thaw some, but can be re-froze when you receive them. Each 5 Lb. bag of Sweet Cherries is packed in it's own Styrofoam cooler with a large gel ice pack and then placed into a cardboard box for shipping. We ship Monday and Wednesday of every week all year long excluding holidays. Keep in mind when ordering that there is always less thawing in the fall & winter months than in the summer months.